Greg enlisted in the Army after High School Graduation. He did boot training in Ft. Knox, KY, then served in Ft. Riley, KS with stationing in Germany and other places. He went to Ft. Rucker, AL and became a helicopter pilot where he aced the test....300 possible points and Greg got 300 points. After discharge from Ft. Rucker he was in the U.S. Army Reserves from 1980 to 1994 and worked as a Medivac pilot in California during that time. In 2001 he joined the California National Guard and after 9/11, was put on standby and training for a potential station in the Iraq war. In 2004 he was sent to Kuwait and was there until he was injured and returned home for treatment. After he was medically released he went back to his job of Medivac pilot and the California National Guard until he was medically discharged by the Veterans Admin. in 2013. Greg accumulated 29 years and 7 months military service for the United States of America. Greg was born at St. Francis Hospital in Lynwood and lived in Lakewood from 1961 until approximately l987 when he moved to Placerville. Greg attended St. Pancratius Elementary School, going to Bancroft Jr. High and then to Lakewood High School. He played and excelled at football at Lakewood under the coaching of John Ford. 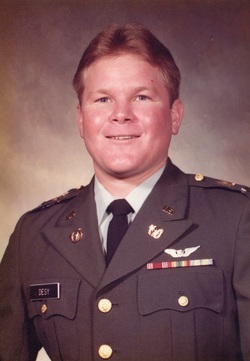 Greg graduated from Lakewood in 1977 and enlisted in the United States Army after graduation. His mother and sister, Lisa and her family, still reside in Lakewood.